Rock in Canada has never been overly sophisticated. Mainly because of the early influences of Canadian bands like the Stampeders, Bachman-Turner Overdrive and the Guess Who, new bands and their record companies had apparently misread what Canadian audiences want. But it looks like the myth of macho-rock has, at least partially, been dispelled. 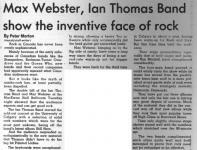 The double bill of the Ian Thomas Band and Max Webster at the MacEwan Hall Ballroom Tuesday night showed that the audience expects and can get good rock. 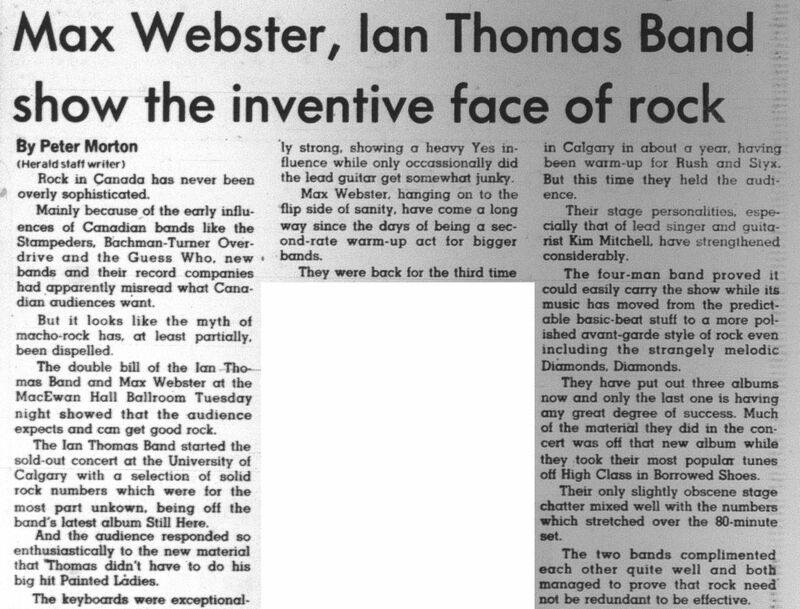 The Ian Thomas Band started the sold-out concert at the University of Calgary with a selection of solid rock numbers which were for the most part unknown, being off the band's latest album Still Here. And the audience responded so enthusiastically to the new material that Thomas didn't have to do his big hit Painted Ladies. The keyboards were exceptionally strong, showing a heavy Yes influence while only occasionally did the lead guitar get somewhat junk. Max Webster, hanging on to the flip side of sanity, have come a long way since the days of being a second-rate warm-up act for bigger bands. They were back for the third time in Calgary in about a year, having been warm-up for Rush and Styx. But this time they held the audience. Their stage personalities, especially that of lead singer and guitarist Kim Mitchell, have strengthened considerably. The four-man band proved it could easily carry the show while its music has moved from the predictable basic-beat stuff to a more polished avant-garde style of rock even including the strangely melodic Diamonds, Diamonds. They have put out three albums now and only the last one is having any great degree of success. Much of the material they did in the concert was off that new album while they took their most popular tunes off High Class in Borrowed Shoes. Their only slightly obscene stage chatter mixed well with the numbers which stretched over the 80-minute set. The two bands complimented eachother quite well and both managed to prove that rock need not be redundant to be effective.